Anti-poverty organizations such as Campaign 2000 and Canada Without Poverty have historically taken a multi-faceted approach to alleviating poverty, including proposals for affordable housing, universal child care, good jobs, parent supports and adequate family income.5 A key component of these poverty reduction recommendations has long been a demand for a geared-to-income child benefit directed to families, robust enough to have an impact on family poverty. 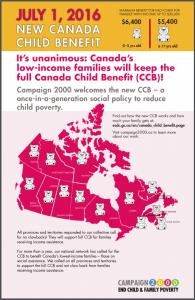 In response to a 1989 unanimously supported motion in Parliament to eradicate child poverty by the year 2000, a child benefit was introduced across Canada. Although the national child benefit was income-tested and targeted to lower-income children and was welcomed, it was not substantial enough to make a significant impact. The federal government re-purposed the two components of the national child benefit, the Canada Child Tax Benefit and the National Child Benefit Supplement. These funds, together with funds from the cancelled flat-rate ($100/month for each child under age six) Universal Child Care Benefit and from cancelling income splitting between parents with children younger than 18 years were used to create a new geared-to-income Canada Child Benefit (CCB) beginning in mid-2016. 1Statistics Canada. 1998 Low Income Persons. 1980 – 1997; CICH Profile 3rd edition, 2000, p. 181, Table 7.4; Number of Children Living in Poverty Under 18 Years, Canada and Statistics Canada CANSIM Table 051-0001 http://www5.statcan.gc.ca/cansim/a26?lang=eng&id=0510001&p2=33 -accessed August 9, 2017. 2Khanna, Anita, et al. A Road Map to Eradicate Child & Family Poverty: Campaign 2000 Report Card on Child and Family Poverty in Canada, 2016. Campaign 2000. Toronto. November 2016 ISBN: 1-894250-91-5 http://campaign2000.ca/wp-content/uploads/2016/11/Campaign2000NationalReportCard2016Eng.pdf -accessed March 10, 2017. 4Macdonald, D. and Daniel Wilson, Shameful Neglect: Indigenous Child Poverty in Canada; Canadian Centre for Policy Alternatives, Ottawa. May 2016. https://www.policyalternatives.ca/publications/reports/shameful-neglect -accessed July 31, 2017. 5Canada Without Poverty. 251 Bank Street, 5th, Floor, Ottawa ON. http://www.cwp-csp.ca/ -accessed March 10, 2017. 6Government of Canada. (2016). 2016 A Plan for Middle Class Progress Fall Economic Statement 2016. Department of Finance Canada. Cat. No. : F1-52E-PDF© Her Majesty the Queen in Right of Canada. http://www.budget.gc.ca/fes-eea/2016/docs/statement-enonce/fes-eea-2016-eng.pdf -accessed March 10, 2017. 7McGregor, J. (2016). Canada child benefit seen as fighting poverty – as long as provinces co-operate: Campaign 2000 tracking provincial confirmations that the new federal benefit won’t impact social assistance. Posted Jul 14, 2016 5:00 AM ET – last updated July 14, 2016 5:29 AM ET http://www.cbc.ca/news/politics/ccb-social-assistance-clawback-provinces-campaign-2000-1.3675873 -accessed March 10, 2017.